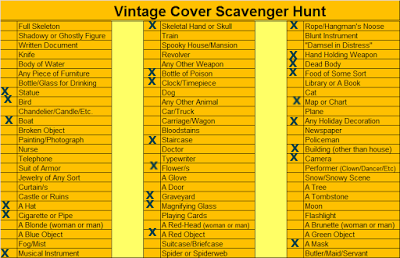 Once again for 2017, Bev Hankins has challenged mystery readers to locate books for her 2017 Vintage Cover Scavenger hunt. 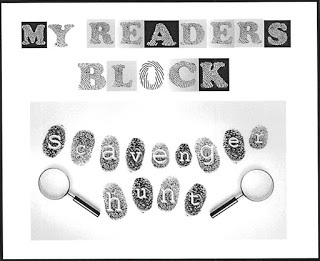 The object of this hunt to locate and read books with the objects on the covers which are given in one of the two grids given below. There is a Golden Cover Scavenger Hunt for mystery novels which were written before 1960. 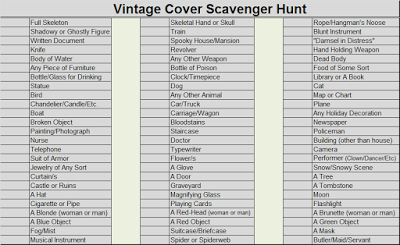 There is also a Silver Cover Scavenger Hunt for mystery novels written between 1960 and 1989. The challenge participant must locate six or more objects from their chosen period. The adventurous may locate six or more from both periods. A final post listed those titles which you have read must be submitted, and there are Prizes to be won. For more detailed information, see Bev's Rules for this challenge. I am entering in the Golden Cover Scavenger hunt, but I may get carried away and try the Silver Cover Scavenger hunt, too. Books read for the Golden Vintage Cover Scavenger Hunt 2017. 1. A Graveyard to Let by Carter Dickson. 1949. Picture of a graveyard. 2. Where There's Smoke by Stewart Sterling. 1946. Picture of a red object. 3. Dr. Priestly's Quest by John Rhode. 1926. Picture of a magnifying glass. 4. The Book of the Lion by Elizabeth Daly. 1948. Picture of a staircase. 5. Antidote to Venom by Freeman Wills Crofts. 1938. Picture of a building other than a house. 6. Nothing Can Rescue Me by Elizabeth Daly, 1943. Picture of a statue. 7. Somewhere in the House by Elizabeth Daly, 1946. Picture of a musical instrument. 8. Crime Hound by Mary Semple Scott. 1940. Picture of a hand holding a weapon. 9. Do Not Murder Before Christmas by Jack Iams. 1949. Picture of any holiday decoration. 10. Blood Money by Dashiell Hammett. 1927. Picture of a rope. 11. Hamlet, Revenge! by Michael Innes, 1937. Picture of a camera. 12. The Mad Hatter Mystery by John Dickson Carr. 1933. Picture of a hat. 13. Death on a Quiet Day by Michael Innes. 1957. Picture of food of some sort. 14 Buried for Pleasure by Edmund Crispin. 1949. Picture of a pipe. 15. Minute for Murder by Nicholas Blake, 1947. Picture of a clock. 16. Cold Steal by Alice Tilton, 1939. Picture of a mask. 17. Hanged for a Sheep by Francis and Richard Lockridge. 1942. Picture of a skeletal hand. 18. The Plague Court Murders by Carter Dickson, 1934. Picture of a dead body. 19. Mystery in the Channel by Freeman Wills Crofts. 1931, Picture of a boat. 20. The Red Widow Murders by Carter Dickson, 1935. Picture of a bird. 21. Death in Five Boxes by Carter Dickson, 1938. Picture of a bottle of poison. 22. The King is Dead by Ellery Queen, 1952. Picture of a flower. 23. The Man in the Brown Suit by Agatha Christie, 1924. A map. Welcome back! Glad you'll be joining me in 2017.